If you are going on a bog walk or visit with your class group, why not try our bog walk scavenger hunt. The challenge is to find all of the 20 items listed. Good luck. Download a pdf of the IPCC bog walk scavenger hunt for printing. 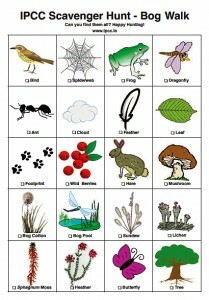 The bog walk scavenger hunt is a great way to help children to observe nature.